From the best-selling author of Shadowmancer comes an enthralling new series of illustra-novellas. 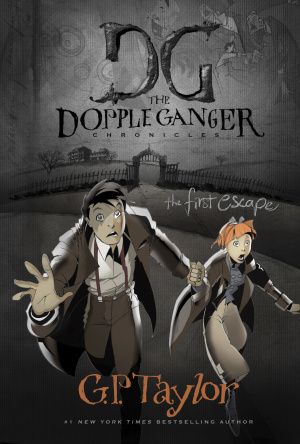 The First Escape is the first book in the Dopple Ganger Chronicles, a six-book series following three children--Sadie and Saskia Dopple and Erik Morrissey Ganger. Sadie and Saskia are mischievous identical twins living at an orphanage, where Erik is their only friend. They are separated when Saskia is adopted by Muzz Elliott, a wealthy woman searching for her long-lost family treasure. While Saskia stumbles into the center of a crime only she can stop, Sadie and Erik embark on a quest to find her. This book is in an exciting new format called an "illustra-novella," in which the story is told alternately in graphic novel format and plain text with occasional illustrations. A motorcyclist and former rock band roadie turned Anglican minister, Graham Peter (G. P.) Taylor has been hailed as "hotter than Potter" and "the new C. S. Lewis" in the United Kingdom. His first novel, Shadowmancer, reached #1 on the New York Times bestseller list in 2004 and has been translated into 48 languages. His other novels include Wormwood (another New York Times bestseller which was nominated for a Quill book award), The Shadowmancer Returns: The Curse of Salamander Street, Tersias the Oracle, and Mariah Mundi. The First Escape by G.P. Taylor was published by Authentic in September 2008 and is our 22442nd best seller. The ISBN for The First Escape is 9781414319476. The first in a series of six books in this new format called ‘illustra-novella’ a mixture of manga type comic format and ‘normal’ text. Sadie and Saskia Dopple, identical twins, have been left at a horrible orphanage by their ‘forgetful’ actress mother, and there meet Erik Ganger who was left by his father ‘just for a little while’ some years ago. Soon after the start of the book, one sister is ‘adopted’. Her sister with Erik’s help stages a breakout for them both and excitement follows! A bookful of incredible characters I am looking forward to meeting again in the next adventures. I surprised myself by how much I enjoyed this story. Visit www.dopplegangerchronicles.com and have fun! I passed this book to my grandson and he really liked the mixture of cartoon and normal text, so do have a look. Got a question? No problem! Just click here to ask us about The First Escape.